Windows Vista has a demanding hardware specification for Premium Ready PC that will enable all advanced 3D features that make Windows Vista a worthy upgrade from Windows XP such as Windows Aero glass transparency effect, Windows Flip 3D and Windows DreamScene. However, with some simple utility, you can actually make and transform Windows XP with 3D features from Windows Vista without even upgrading the system hardware such as graphics card. One of them is TopDesk which enables Windows Flip 3D Vista feature in Windows XP. Another tool is Madotate which will transform Windows XP desktop into flippable 3D desktop. Madotate is a Japanese window manipulation tool which has started to be developed since 1999, and perform function similar to Microsoft Task Gallery which has since stopped development but its ideas may have contributed to the development of Windows Flip 3D. Madotate a button to the standard set of buttons for minimizing, maximizing, and closing windows on the title bar of open windows. The new button, when click, will minimize and flip the window into a 3D desktop space, with its lower half receding into the distance. Other than that, Madotate also allows the flipped or flattened windows with its own title tab to be docked in 3D to the left, right, top, bottom of the screen like stacked transparent glass window panes and or arranged anywhere to your liking. Madotate freeware works on Windows 95, Windows 98, Windows Me, Windows 2000 and Windowns XP, although translucent effect is not complete in operating system earlier than Windows 2000. The bad thing about Madotate is that it’s originally available in Japanese language only at original author Takayuki Shinohara’s site. However, a fully translated to English version has been done and available for download. Both is available for free download. Download Madotate 2.02.02: Madotate_2.02.02.zip (English Translation edition). Download Madotate version 2.02.02 (Japanese version self-extracting archive). Madotate program only takes up a small memory resources and only shows as a icon in the System Tray area of the Windows taskbar system tray (notification area). To run Madotate properly, both “madotate.exe” and “mtatecfg.exe” from the zip archive must be placed together in the same folder, or else the settings or preference menu will be inaccessible. Beside, be default, Medotate turns off the transparency for 3D effects. To enable the transparency effect, right click on Madotate icon in system tray or the additional icon on each window’s title bar, and choose Settings. Then select (click or tick) “Transparency for 3D effects”. The slider bar below it determines how much transparent you want a window to be. To convert or transform (Madotate term is lower) a window to 3D window, simply click on the Madotate icon on the title bar. To restore back to 2D window, simply click on the flattened window, or right click on it and choose “Restore to 2D”. You can also swap axes of window by right click on it. 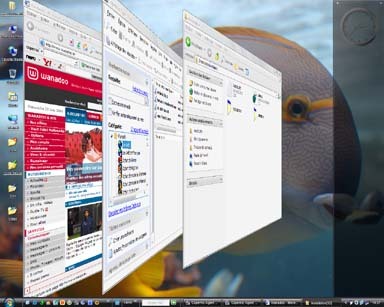 To move the 3D window around the desktop, click and drag.